Press Pen: GUAM Beauty Mud Pop-Up Event! A couple of weeks ago, I had the pleasure of attending the GUAM Beauty Mud Pop-Up at the Roger Smith Hotel. 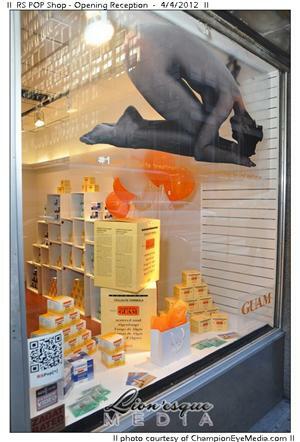 GUAM Beauty Mud is Europe’s #1 anti-cellulite product. The event was for beauty and fashion industry insiders and the general public. The event featured a fabulous line of sponsors who all generously contributed their products to the event. The sponsors included Popchips, Wines by Wives (a celebrity wine of the month club), and Dressbarn. Also, the gift bag included Popchips, GUAM Beauty Mud products to test out, and an emergency fashion kit from Dressbarn. I had an amazing time at the event, and although I haven’t tested the GUAM Beauty Mud samples, I will be soon. S/O and thank you to Jordanna from @TouchofPinkPR for hosting an amazing event and inviting me! Touch of Pink PR is definitely on its way to being a major force in fashion PR so check them out here: www.touchofpinkpr.com. And there it is. de la Pen…All Pen Everything. P.S. Check out photos from the event here: http://flic.kr/s/aHsjyQJ4g3. a charity party, you will be the star in the crowd. These dresses will be value added additions to any contemporary wardrobe. urban parts of the country prefer to wear western dresses. de la Pen has moved!